Kraemer rehabilitated three Wisconsin Southern Rail (WSOR) structures (Bridges 824, 826, and 841) over the Sheboygan and Mullet Rivers near Sheboygan Falls, WI and Plymouth, WI. 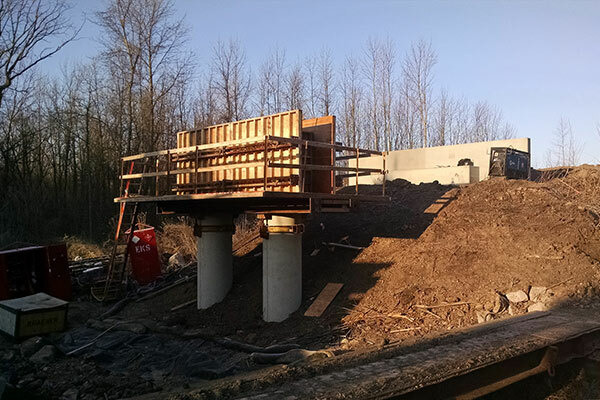 Work included full removal of the existing timber trestle at the Plymouth location, construction of two new CIP pier caps founded on 36-inch diameter caissons, and two new precast abutments founded on piling. The new structure is a three-span steel beam bridge with a new timber tie deck and walkway. Steel bridge rehab work over the Sheboygan River included the removal and replacement of existing bottom cover plates, stringer replacement, gusset and stiffener remove and replace, and remove-clean-replace existing bearings.